So the only thing better than eating apples or carving pumpkins is sending them sailing through the air and watching them smash on the ground, sending juice and pumpkin guts flying. This somewhat destructive activity is a favorite among children (and, let’s be honest, adults, too) at certain orchards throughout the Chippewa Valley. 6470 Balsam Road, Eau Claire • 839-8370 • www.eauclaireorchards.com • This orchard celebrates their apples by slinging them with their apple slingshot, sending fruit soaring over 175 feet into the air at about 50 mph. Open Monday-Saturday 10am-6pm and Sundays 10am-5pm. N7240 810th St., Elk Mound • 879-5179 • www.pleasantvalleytree.com • This tree farm takes produce launching to a whole new level. 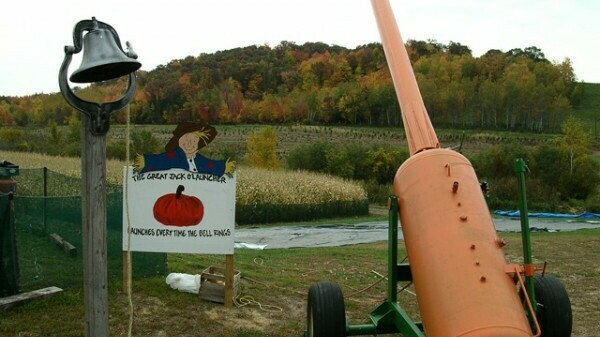 Their catapult, the mighty Jack-o-Launcher, is sure to delight your pumpkin bursting fancies, but make sure they go far enough that you won’t get sprayed with slimy seeds. But if flying apples are more your style, then check out the new apple thrower, Annie the Apple Slinger. Open everyday 10am-6pm from Sept. 26 through October.